Eight folks from NRCS, UCCE, and the CASI Workgroup met with Dr. Doug Karlen of the USDA ARS National Lab for Agriculture and the Environment in Ames, IA on July 1st on the UC Davis campus to discuss the California farm demonstration network and to get ideas for improving the network as we move forward. Karlen is a distinguished soil scientist at the National ARS Lab and has contributed a very large amount of research during his illustrious career to a range of soil quality topics and efforts. He is a Fellow in each of the Tri-Societies, - the American Society of Agronomy, the Crop Science Society of America, and the Soil Science Society of America, and was also one of the very first scientists to begin discussion and work on the concept of soil quality, or more recently, the area of soil health. Karlen and Susan Andrews, who worked with him as a Post-Doc ecologist for several years before leading the early formation of the Soil Quality Institute with NRCS, have done quite a lot of work in California on soil quality and published several research papers on work they collaborated with California scientists on the topic based on work conducted in Five Points and Davis. 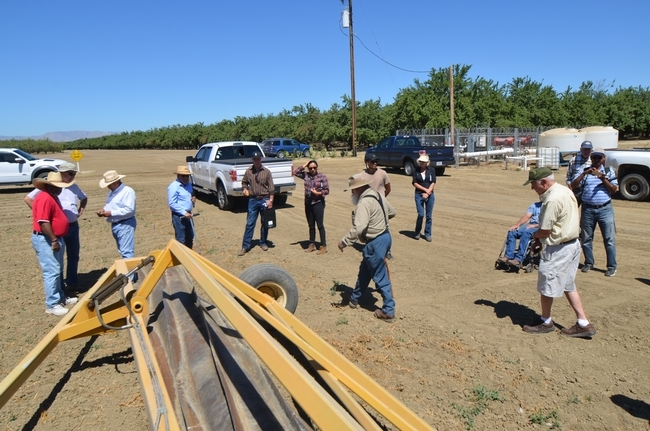 Upon being introduced to our California farm demo network and its goals, Karlen offered a number of insights based on his own experience and familiarity with efforts similar to ours in other states. 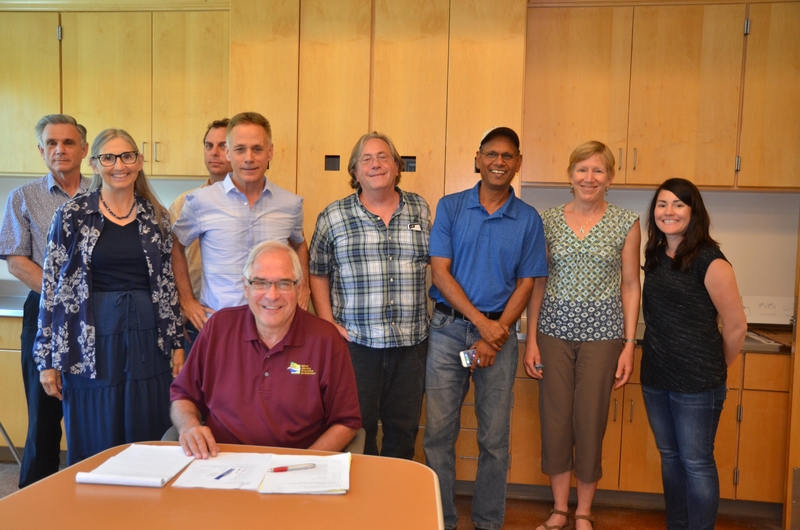 Following the focused discussion, several folks continued their discussions with Karlen for a luncheon by the NRCS State Offices in downtown Davis. We thank Doug Karlen for taking time to meet and talk with us. It was most productive and helpful. Audience in attendance on June 23 to see work being done at Sano Farms. The last in a series of five farm visits highlighting soil health goals and the variety of ways in which these goals are being realized at farms throughout the Central Valley took place at Sano Farms in Firebaugh, CA on Friday, June 24th with about forty attendees. Farm owner, Alan Sano, and farm manager, Jesse Sanchez, provided a very detailed and informative overview of the practices, equipment and principles that are being used at Sano Farms now for over ten years. These practices include the use of winter cover crop mixtures, reduced disturbance tillage that relies on the use of a cover crop roller, a chopper and a bed shaper, and subsurface drip irrigation. Benefits that have resulted from these practices include improved soil function in terms of water movement and storage, reduced costs related to tillage, and the ability to reduce fertilizer inputs while keeping high yields and crop quality. Together, the practices that are now successfully employed by Sano and Sanchez, not only cut production costs, but they also reduce GHG emissions through the use of less tillage and tractor passes through the field, and they also build soil C and N, thereby removing these elements from the atmosphere and storing them in the soil. A video summarizing the farm visit at Sano Farms is available at the You Tube link below. 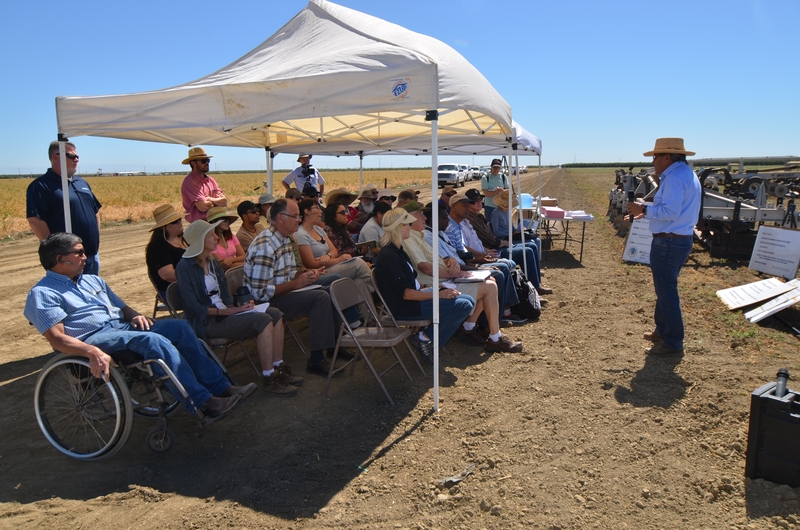 The fourth in our series of five farm visits that are part of the California Farm Demonstration Network will be taking place this Wednesday, June 15th, beginning at 10:00 AM and winding up at about 11:45 AM at the farm of Tom and Denesse Willey at the southwest corner of the intersection of Road 20 and Avenue 14 about five miles west of the town of Madera, CA. 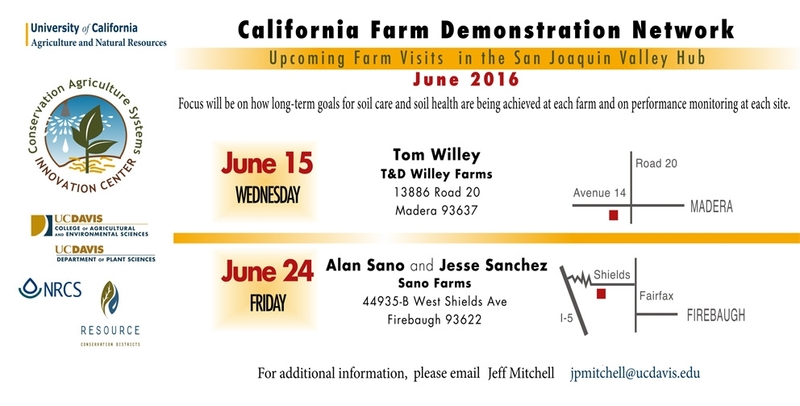 As with each of the other farm visits that are being hosted during May and June by a variety of farmers in the San Joaquin Valley, the visit with Tom Willey will focus on his long-term goals for soil health and the practices that he uses to achieve those goals. Participants will have an opportunity to learn what Tom has been doing at T & D Willey Farms over the years and what he has learned as a result of his soil care practices. In addition, we will all also have an opportunity to contribute to some actual data collection following Tom's introductory discussion that will be part of the discovery process of the farm demonstration network and that will serve as baseline information for future comparisons and monitoring. If anyone is leaving the Davis, CA to come to the event and is interested in carpooling, please contact Jessica Rudnick at jrudnick@ucdavis.edu.